The home grown Commercial vehicle manufacturer, Ashok Leyland had launched Stile in Mumbai today in three variants - LE, LS and LX. The MPV has been launched at a starting price of INR 7.49 Lakh. Standard across the lineup are features such as air conditioning, power steering, tilt-adjustable steering and foldable seats. It will be powered by the same 1.5-litre dCi (K9K) diesel engine and will have an output of 75 PS and 185 Nm and is mated to a 5-speed transmission. The engine is capable of returning a fuel economy of 19.5 kmpl, claims Ashok Leyland. Ashok Leyland’s Stile will be available in five different shades, namely, sparking white, silky grey, moon grey, passion red and imperial black. The MPV comes with a 2 year or 50,000 km warranty and will be sold through the company’s 130 LCV outlets across the country. Ashok Leyland is also looking to introduce its LCV dealerships in the north east market. “We are extremely delighted to launch the second product from the Ashok Leyland Nissan JV, which we believe will change the dynamics of Indian MPVs. 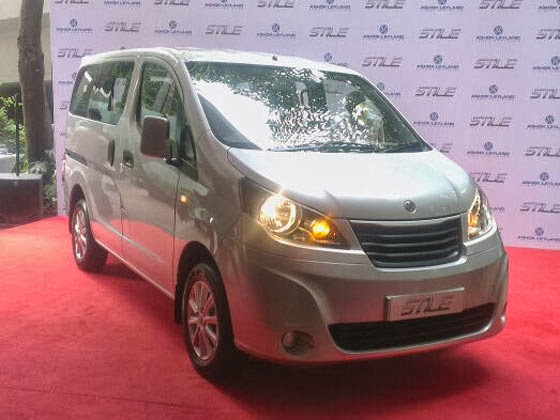 With Stile our mission was clear - to deliver to the Indian customer a contemporary MPV with lots of space, contemporary styling, comfort features and most of all, class leading fuel efficiency. Stile is developed on a trusted and reliable vehicle platform that reflects our continued focus on offering Japanese technology and quality at Indian cost. With the Stile also in our portfolio, we are now better positioned to cater to a wider customer base and range of transportation needs, said Dr. V Sumantran, Vice Chairman, Ashok Leyland.